In the Tea & Tech series, I sit down with guests and have a lively, totally unscripted chat and about a whole range of different issues and ideas in the modern technological world – over a nice up of a tea, of course. In Episode 1 – I find out why my good friend Andrew Sellick still owns and uses a “Dumbphone” (not a smartphone) and whether I can convince him to join the rest of us in the 21st century with a modern smartphone. The aim of the Tea & Tech series is to take a step back from the usual in-depth, often technical, Tech Chap reviews and look at the world of technology more holistically. I received a comment on one of my YouTube videos criticising how I spent too much time comparing a Samsung tablet to it’s competition, and not enough time simply reviewing it. Valid or not, the comment made me realise that in order to offer an educated opinion on a product, you can’t be reviewing it on the basis that it is in a vacuum or a void – assessing the competition and the wider current technology landscape is crucial to be able to offer relevant and well-founded opinions. With this, and a love of a nice cup of tea in mind – I have created the Tea & Tech series. From real-world to science-fiction, from in your pocket to in your car and from the present to the future – I will be discussing a veritable plethora of technology issues and ideas – hopefully entertaining you in the process! 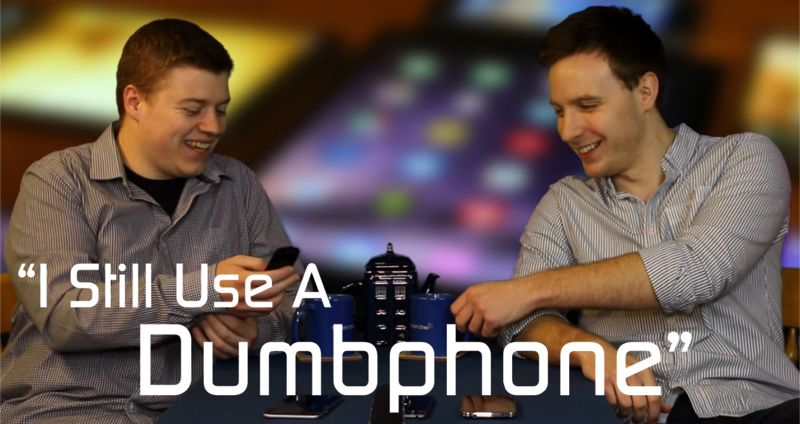 If you have any thoughts on the ‘dumbphone vs smartphone’ debate – leave a comment and we’ll discuss some of your views in the next episode! Please subscribe to my YouTube channel stay up to date with the latest Tech Chap releases!